The State Department on Monday would not rule out giving Iran up to $50 billion as a so-called "signing bonus" for agreeing to a nuclear deal later this year, according to comments made to journalists following reports that the Obama administration had formulated a plan to release tens of billions of frozen Iranian funds. Experts have said this multi-billion dollar "signing bonus" option, which was first reported by the Wall Street Journal, could be the largest cash infusion to a terror-backing regime in recent memory. A cash release of $30 to $50 billion upon reaching a final nuclear agreement would come in addition to the more than $11 billion in unfrozen assets that Iran will already have received under an interim nuclear accord reached in 2013. When asked to address these reports on Monday, State Department Spokeswoman Marie Harf attempted to dodge the issue and then accused reporters of getting "spun up" on the issue. Asked whether Iran could receive $50 billion "on day one after signing" or verbally agreeing to a nuclear deal, Harf told reporters that she would "look into it." When pressed to provide an answer about the Journal's initial report, Harf declined "to go line by line in the story." Harf said sanctions relief to Iran will continue through June 30. Jonathan Schanzer, a top terrorism-funding expert at the Foundation for Defense of Democracies (FDD), said such a cash release to Iran would enable the regime to continue backing various terror groups such as Hamas and Hezbollah. “This could be the largest cash infusion to a state sponsor of terrorism in modern history,” Schanzer said. Reports of this “signing bonus” come following concessions to Iran—which range from sanctions relief to continued nuclear work at military sites—during the most recent round of negotiations in Lausanne, Switzerland. Lawmakers and experts critical of the Obama administration’s diplomacy with Iran have warned that a slew of recent concessions in the talks would enable Iran to continue many aspects of its nuclear program. 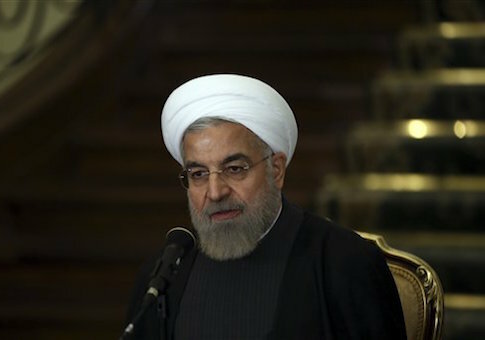 Iran is pushing to prohibit international inspectors from accessing possible military sites until after the United States provides substantial relief from economic sanctions. Nuclear experts such as David Albright, founder of the Institute for Science and International Security (ISIS), have warned that premature sanctions relief could gut the tough inspections and oversight regime on Iran promised by the Obama administration. Under the framework agreement, Iran also would be permitted to store around 1,000 advanced nuclear centrifuges at an underground and fortified one-time military site known as Fordow, according to the Associated Press. By keeping Fordow active, Iran would potentially be able to produce weapons-grade material in just a few weeks, according to Albright. The New York Times reported that Iran is refusing to give up its stockpile of enriched uranium, the key component in a nuclear bomb. Under previous conditions, Iran would have had to ship these materials out of the country. These stockpiles would also give Iran the ability to produce highly enriched weapons-grade uranium in less than six months, according to experts. One congressional aide apprised of the ongoing talks with Iran said the administration continues to relent on key demands in order to keep Iran at the bargaining table.